Thousands of children in our area face challenges every day. Those who have positive role models in addition to their families are more likely to succeed than those who do not. 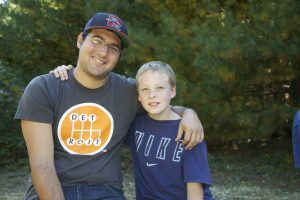 Big Brothers Big Sisters’ one-to-one mentoring programs are proven to help children overcome adversity and beat the odds. Big Brothers Big Sisters programs are designed to match children age 6 and older with mentors in professionally supported one-to-one friendships. Before we make a match, we do our homework. After someone expresses an interest in becoming a Big, they go through an extensive background check and careful interview process. Then, Bigs and Littles are matched based on location, personalities and preferences. And full support is provided to the Big, Little, and their family from the start, so matches can grow into lasting, impactful friendships. What’s a Big and Little to do? For more information about our programs, contact Customer Relations at [email protected] or 269-382-6800 x108.